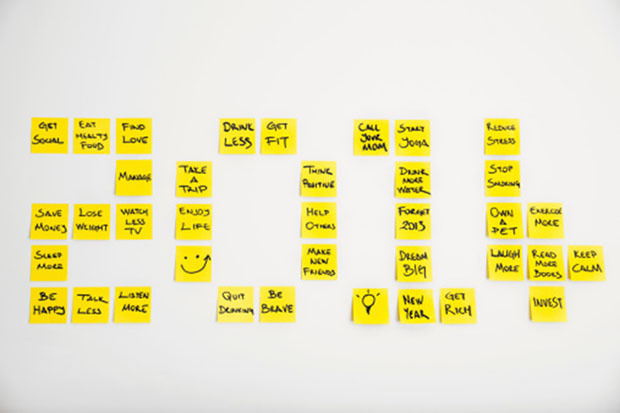 5 ways to actually keep your New Year’s resolutions! We all dream of this at the end of every December. “Oh, next year I am going to follow all the resolutions that I couldn’t keep up with this year!” we would exclaim. This 2014, why not actually keep them? Don’t make a short list of huge goals. Make a list with many smaller goals or break down huge goals into smaller goals. If you need to put down 20 resolutions, go for it! The smaller your goals are, the faster it is for you to accomplish them. One goal accomplished and it will serve as motivation enough for your next chunk of the goal! 2. Print or write out copies of your resolutions. Save a copy on each computer or electronic device you own, such as your smart phone, iPad, Note, Laptop. Keep a copy of it and stick it to your work desk. Post a copy on the outside of your refrigerator. Set up dates for evaluation with a mentor. This helps you to stay focused and evaluates methods for improvement. Having a group, partner, friend, or professional to encourage you can be a great way to keep you going. Try finding a friend who has a similar resolution, and check in with each other every week to talk about your progress and challenges. Most people like to keep quiet about their goals, in case they fail. Well, we don’t want to fail at them, do we? Talk about it to people around you. They will act as reminders to keep up with the goals. Share your experiences with family and friends. Consider joining a support group to reach your goals, such as a workout class at your gym or a group of coworkers quitting smoking. Having someone to share your struggles and successes with makes your journey much easier, more fun and less intimidating. When making your plan, a vital feature should be the rewards and treats you will give yourself at those all-important milestones. But be warned, don’t fall into the trap of putting your goal in danger – it’s too easy for a dieter to say “I’ve been so good, I deserve a few candy bars”, or a saver to throw caution to the wind with a new purchase. One slip, and it could all be over.New year.